Any case study is about a success story and there are 2 ways to present it. The first way is to explain how series of deliberate and logical decisions have led to the success. The steps may include iteration and failure but those are presented as a part of the overall process. The process is based on a vision and a clear goal and the people behind knew what they were doing. There is a clear demonstration of cause and effect relationship. It is presented as a chain of action taken, each action resulting in a logical outcome with the underlying assumption that the process is repeatable for similar situation. The second way is to tell the truth. Real story rarely proceeds on a straight line. Initial plan gets modified or even abandoned, the vision evolves, the goal changes. There are many failures on the way and there are unexpected success which are nowhere in the original vision. And, finally there is some amount of luck and coincidence! Some of the successful steps taken would be the result of logical deliberation while others may be a result of organizational politics or taken to satisfy somebody’s gut feeling (? whim). Part of the result might just have happened because of change in the environment or as a byproduct of some other decision. In other words, real story is always messy! 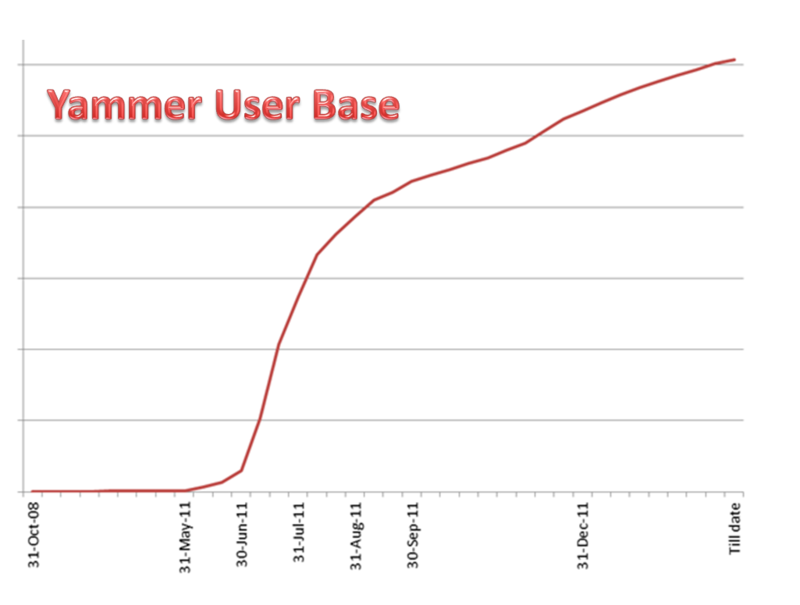 Our Yammer network grew from almost nothing to cover 40% of our people within two months. This had happened without any internal promotion. This happened almost a year back and since then the usage has been growing continuously. Why did it happen? We don’t really have much of a clue! To be fair to us, we did have an Enterprise 2.0 roadmap which was initiated about two and a half years back. Even before we made our roadmap, I had also created a Yammer account but that was lying dormant with around 30 users. As a part of our roadmap we had rolled out a WIKI (using Media Wiki) with some success, a BLOG (using WordPress) with reasonable success (*) and an Enterprise Social Media (using Elgg) which totally failed. We analyzed the failure and concluded that to have any change of success we need a social media which has a user interface which is similar to Facebook or LinkedIn. Off course, there were a group of people who thought neither do we need an enterprise social media platform nor will any such platform succeed. Then … Yammer just took off! Was there a conscious plan to adopt it? … No. Did we promote it internally? … No. Was there any correlation between our decision to look for a Facebook or LinkedIn lookalike platform and the takeoff of Yammer? … Not likely – it happened more than 3 month after the decision. Though it is very tempting to state that they are correlated, my discussion with the early adopters did not bring out any such correlation. Did top management participate? Did their participation help? … Very likely – about a month after it started taking off, our CEO, head of HR and other senior managers joined in. The pace accelerated after that and it is visible in the graph. If you are not aware what Yammer is and not yet Googled it then here is the link. Any organization can setup an account where people can login if they have an email address in the specified domain of the organization. The interface is more like Google+ though there is no concept of a circle or friend. What do people use Yammer for? Basically it is used to share stuff – both light material like jokes and heavy stuff like technical article. Several (more than 200) special interest groups have former … some are very active while others are dormant. People also crib about what they don’t like – about the available facilities … about the company. Surprisingly, some of these cribs get addressed. Any achievements, especially group achievements, gets posted and liked … it becomes an instant form of recognition. Any posts by our CEO and other senior managers have been popular and generates quite a bit of discussion. Some groups have used it to announce internal events. Sometimes, it has also been used to get feedback before introducing something new. People have tried using it for finding solution for technical problem and locating people with specific expertise … but other methods like sending email to our “TechShare” mailing list has been more popular and effective. In a nutshell, people are using it effectively for different reason but we still have no way to quantify the benefit. Did we face any problem? All fun loving staff who wants to share jokes are welcome!! Serious types please beware before joining this group!! Your emotions are at stake! Initially our network security team was concerned but top management presence helped. Many of our people work in our customer environment where the network policies are dictated by the customer. So, for some people Yammer access is not possible during office hours. Do not expect social networking to solve all problems – I am always suspicious of any solution which promises to solve all problems! Are these lessons of any use to you? May be … may be not. You should take each of these advice with a pinch of salt and see if it makes sense in your situation. I would not be surprised if you come up with a list which is diametrically opposite to this. ← Why Consumerization of IT is happening now?